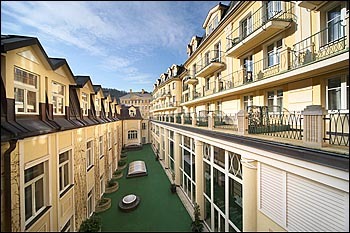 The Carlsbad Plaza is the first ***** star spa & wellness hotel in Karlovy Vary. 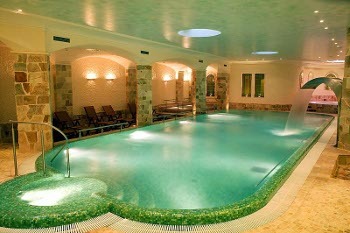 It is located in the quiet ambience of the spa zone, in the vicinity of the spa facility Lazne I. 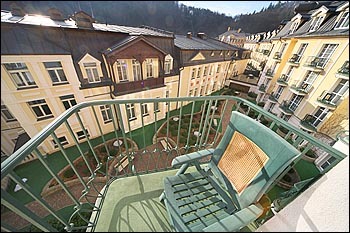 (Spa I). 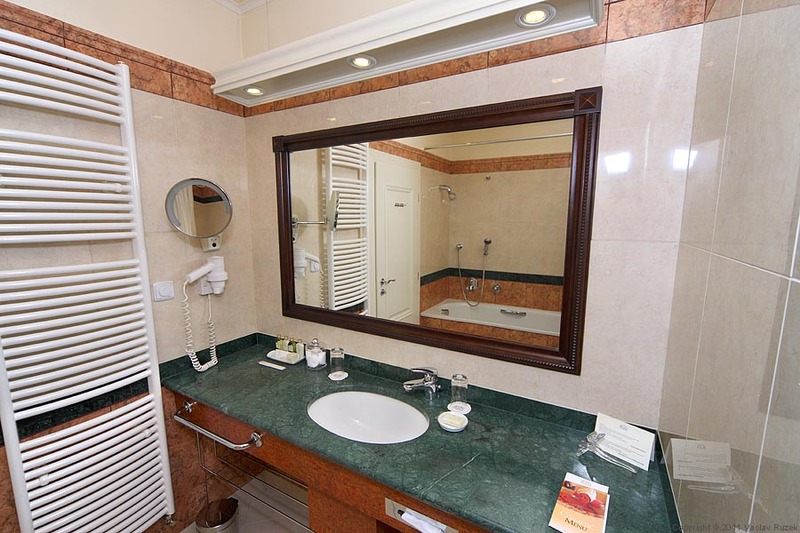 Here, you will find everything what you expect from a deluxe and top class international hotel, including a swimming pool and conference facilities and equipment. 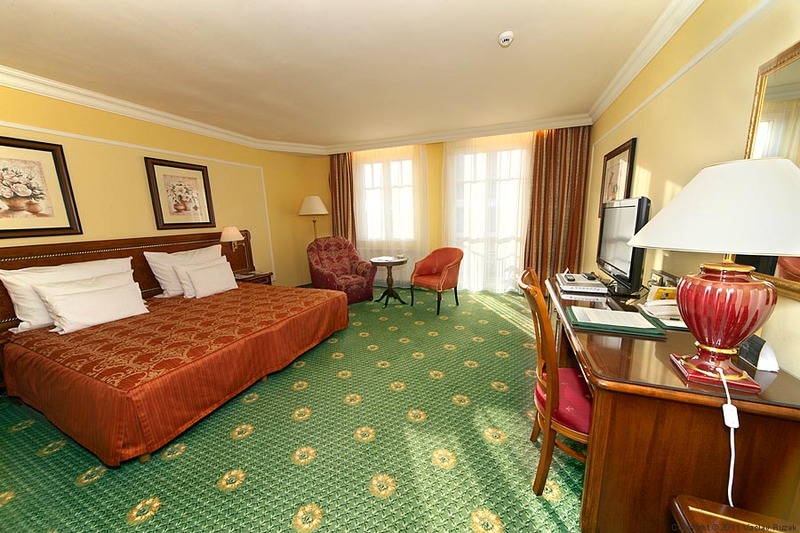 Here, you will find everything what you expect from a deluxe and top class international hotel, including a swimming pool and conference facilities and equipment. 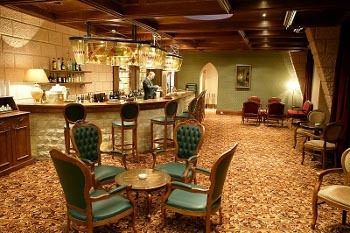 The reconstruction of the historical building from the late 18th century, which was known as Rudolfshof (Rudolph’s Court) and which, since the beginning of its existence, had been providing services to travellers and later to spa guests, among others also to the first Turkish President, Kemal Atatürk, has remodelled this architectural gem into its modern lay out on the inside, while fully preserving its outer historical appearance. 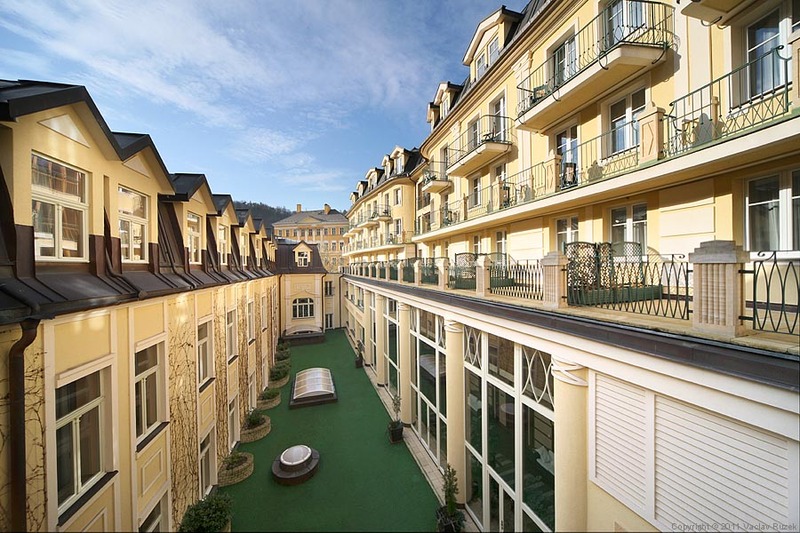 The nostalgic picturesque ambience of the ancient spa town with its typical atmosphere and “genius loci” of the old times may be found in the first Wellnessland in Karlovy Vary, in the Alt Karlsbad. We offer comfortable and luxurious accommodation in the 160 five star guest rooms of various size located in two connected houses. 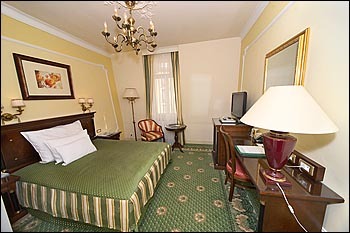 All rooms are furnished with the same type of furniture and all have nice marble bathrooms. 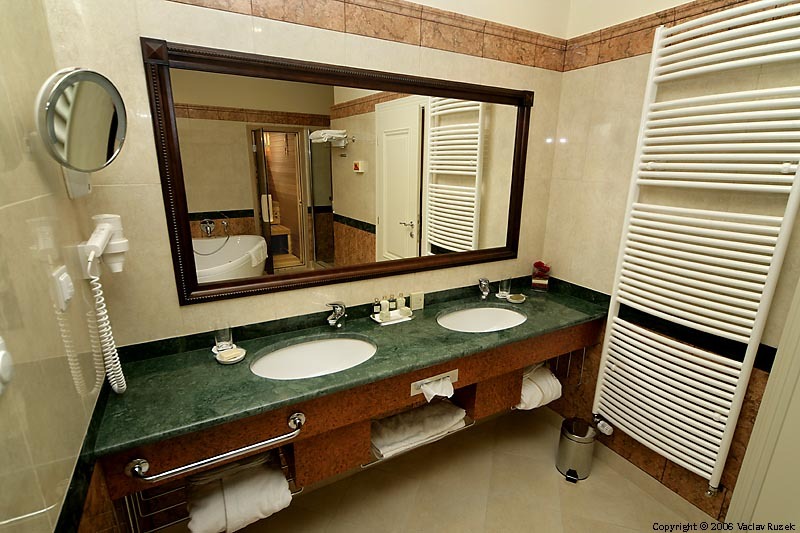 All rooms are equipped with private bathroom, air-condition, minibar, SAT TV, direct-dial telephone and hair dryer. 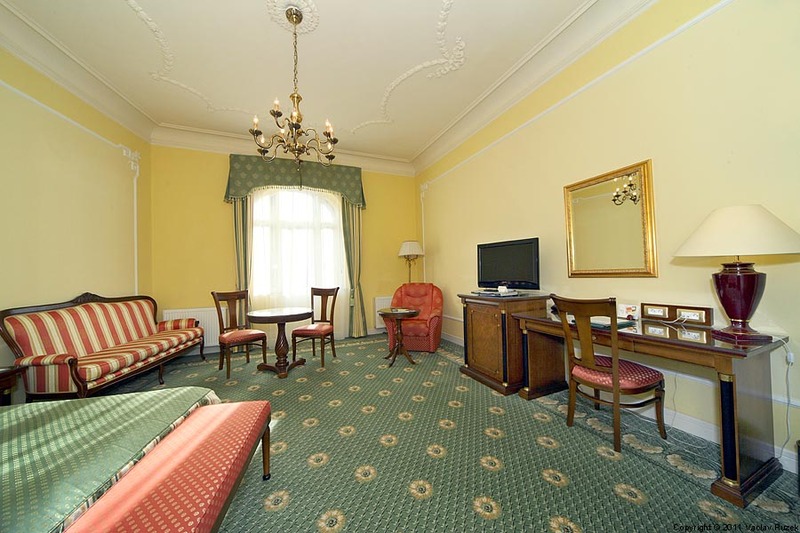 The main benefits of the rooms in the historical building are: flat plasma TV's, coffee/tea making facilities, bathtubs and bidets in the bathrooms and toilet separated from the bathroom. 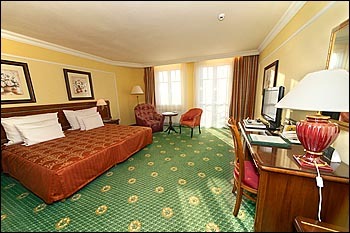 All the rooms except single Queen and Princess rooms are equipped with king size bed 200 x 200 cm. “New House” is a name of an additional section built to the Hotel period core. In this particular section of the Hotel you find a total of 91 luxury rooms situated between the 4th and 8th above-ground floors provided that a passage to “Old House&Rdquo; is located on the 4th floor. 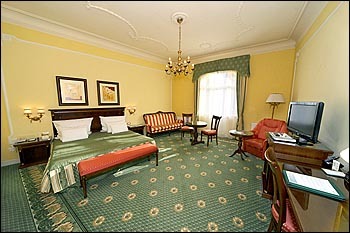 The Queen rooms in the New House are used as single use only. They have the space of 21 m2, a 160 x 200 cm bed, bathroom with shower or bathtub and garden view. 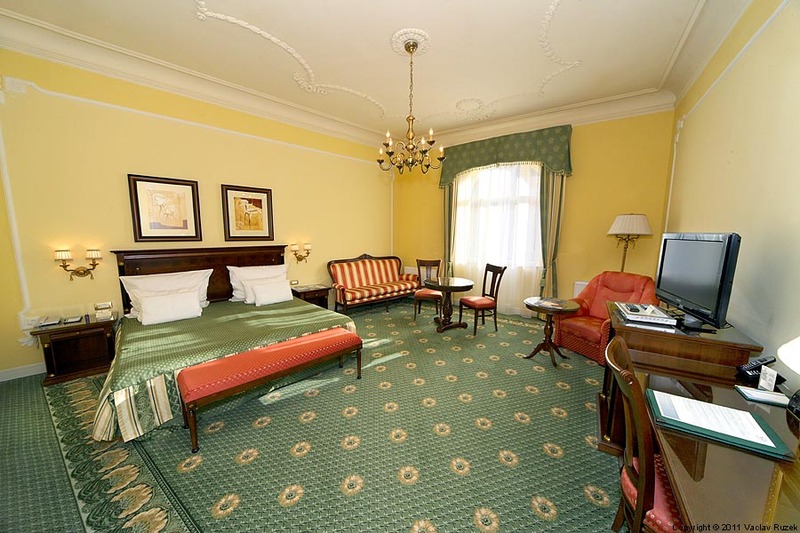 The rooms of the category Comfort are our smallest double rooms with minimal space of 22 m2. 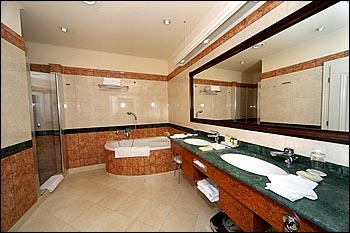 Bathrooms are equipped with showers or bathtubs. Garden view. Rooms Comfort Plus have a balcony. The rooms of the category Superior are larger double rooms, located on the 8th floor of the New House with minimal space of 30 m2. 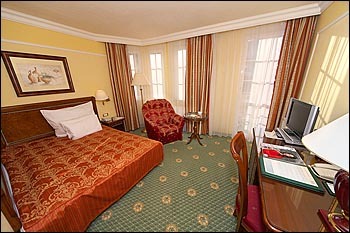 King size bed 200 x 200 cm and extra bed available on request, bathrooms equipped with bathtubs. Garden view. 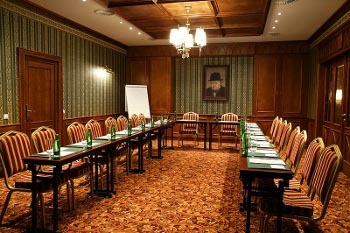 Some of the rooms are connectable. 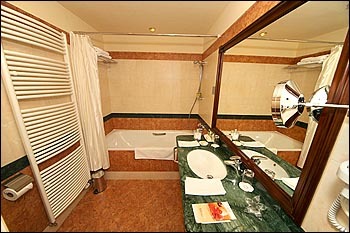 The rooms of the category Comfort Plus are the same as Comfort but have in addition a balcony. 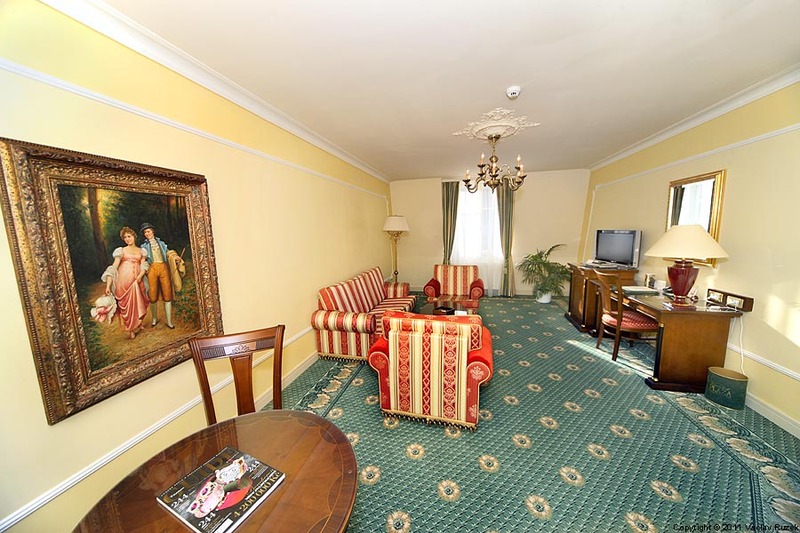 They are located on the 4th-7th floor of the New House with the space of 24 m2. 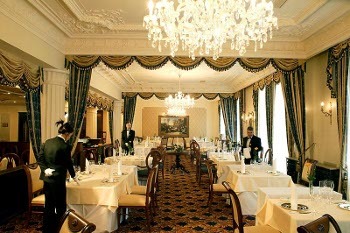 The rooms of the category Superior Plus are the same as Superior but have in addition a balcony or terrace. 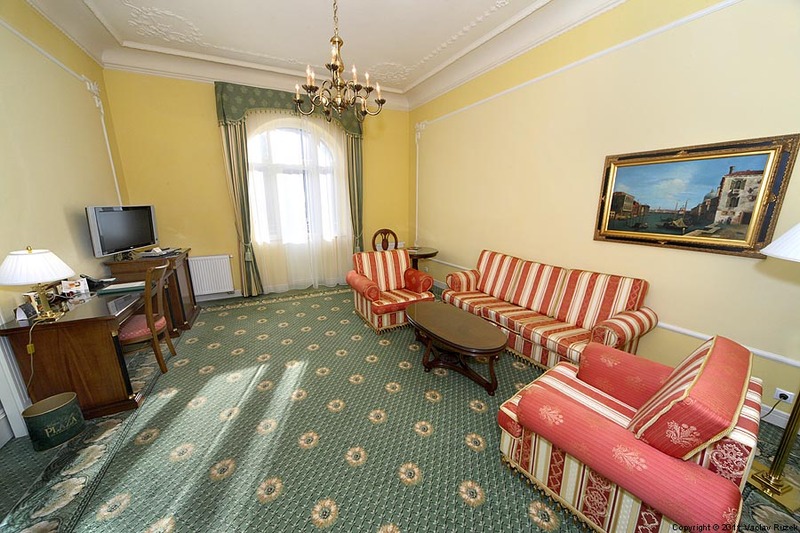 They are located on the 4th-7th floor of the New House with the space of 30 m2. 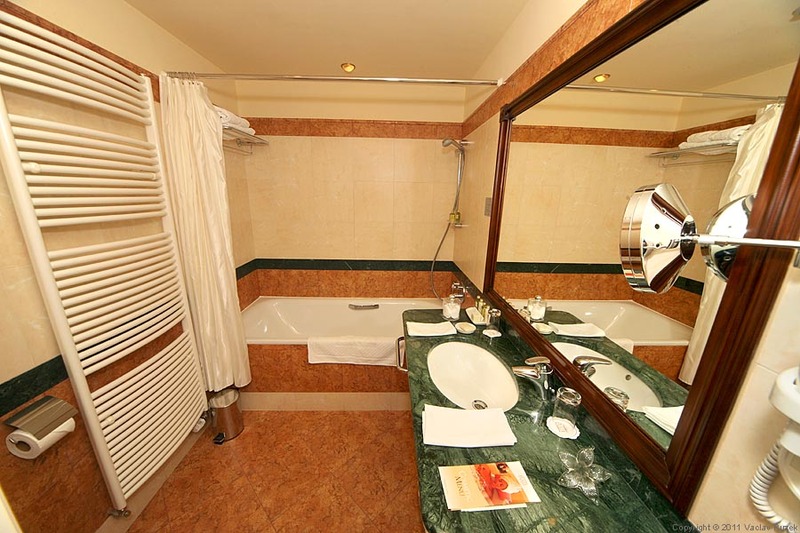 The main benefits of the rooms in the historical building are: beautifull stucco ceilings, coffee/tea making facilities, bathtubs and bidets in the bathrooms and toilet separated from the bathroom. 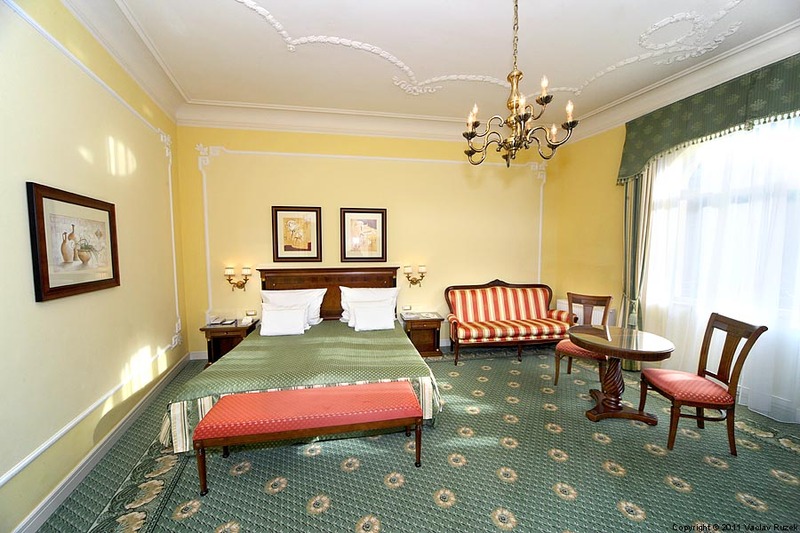 The rooms there have been created due to an overall refurbishment of the period section of the Hotel under a strict supervision of an institute for historical structures conservation. 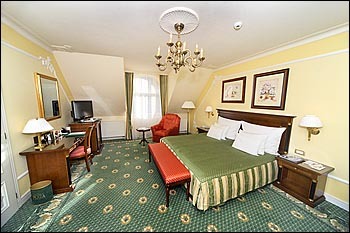 All 69 rooms are situated between the 2nd and 5th above-ground floors. All leisure and social enjoyment starting, e.g.restaurant, night club, etc. 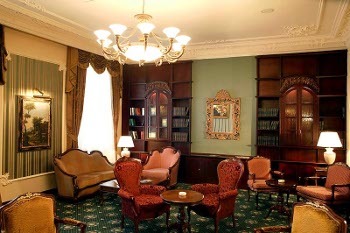 are also situated in Old House. 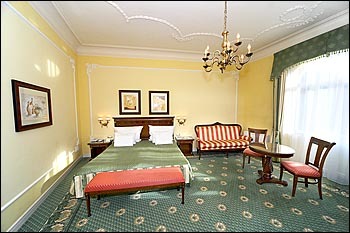 The Princess rooms are used as single use only. 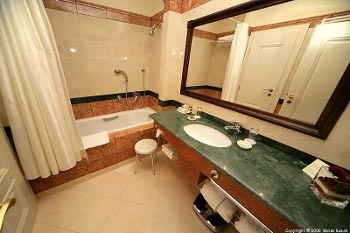 They have the space of 22 m2, a 160 x 200 cm bed, bathroom with shower and separate toilet and bidet. Garden view, stucco ceiling. 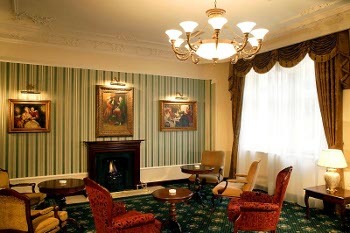 Some rooms connectable with rooms Supreme. 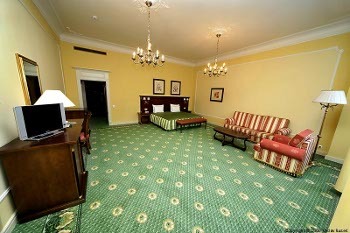 The rooms of the category Excellent are the smallest double rooms in the historical building with minimal space of 25 m2. The rooms have stucco ceilings, bathroom with bathtub and separate toilet and bidet. 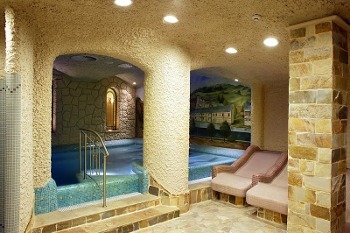 Facing the spa area or garden. 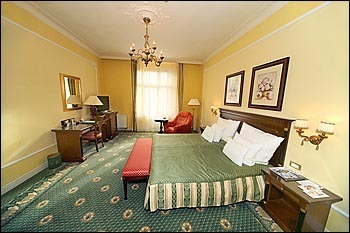 The rooms Supreme are very large double rooms with minimal space of 38 m2. The rooms have stucco ceilings, bathroom with bathtub and separate toilet and bidet. 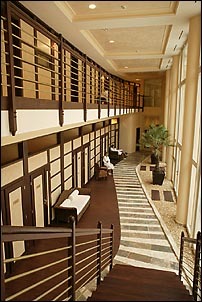 Facing the spa area or garden. 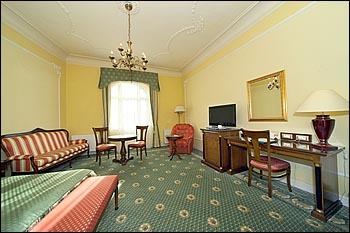 The suites are located in the Old House and are facing the spa area. They have stucco ceilings and bathroom with bathtub and separate toilet and bidet. 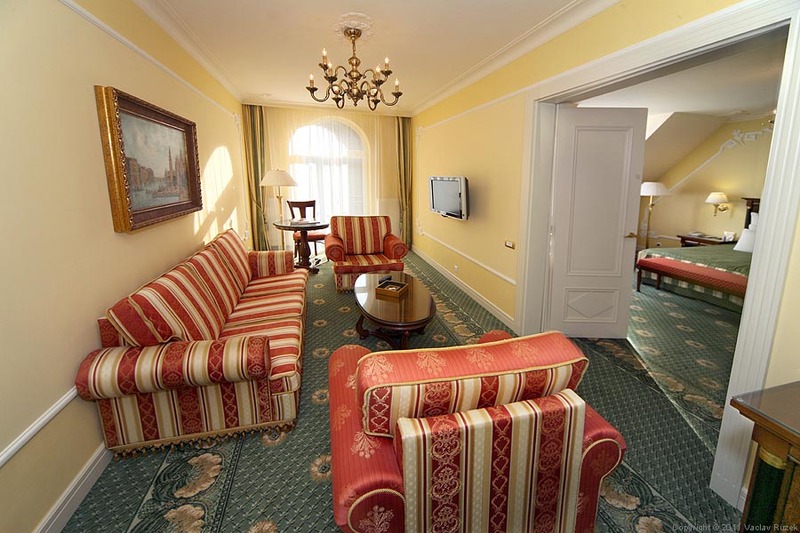 Eight Suite categories accommodate the individual needs and preferences of our guests. 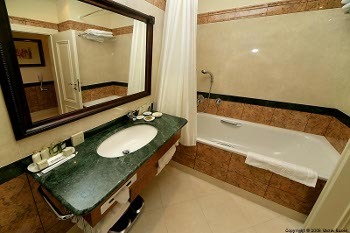 The choice includes for example Sauna in the Suite, Whirlpool for 2 persons, kitchentte or a room for maid or security guard. 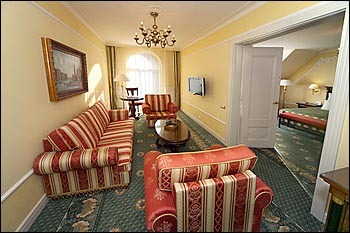 The Presidential Suite offers the widest equipment and matches the highest standards and demands. 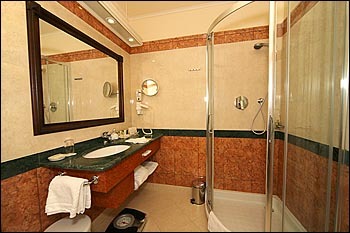 The Splendid Suites have a large bathroom with bathtub and shower stall. 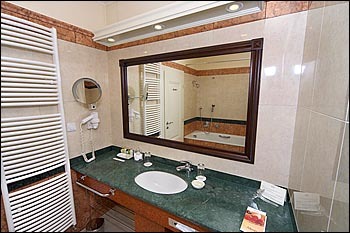 Splendid, Wellness and Exclusive suites have second separate toilet for guests. 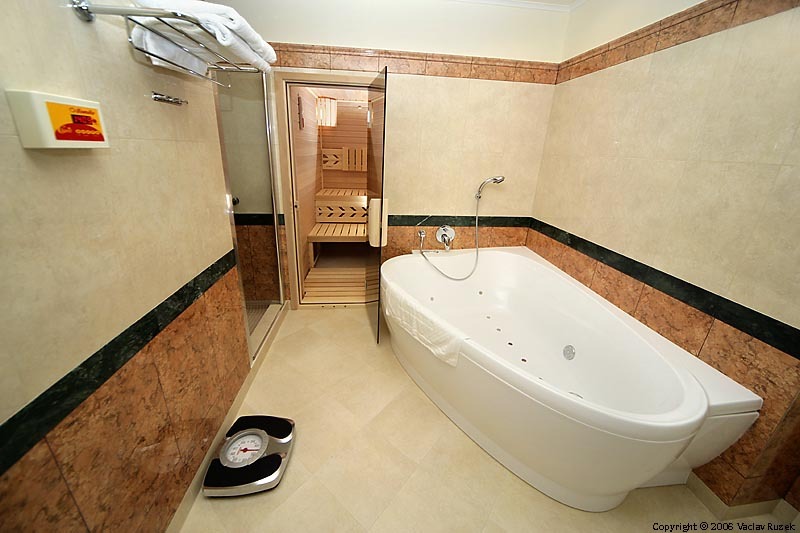 The Wellness Suite has a space of 94 m2, bathroom with whirlpool, private sauna, shower, separate toilet and bidet + separate toilet for guests. Extra beds can be put in following room types: Superior, Superior Plus, Supreme, Business and all Suites (1 extra bed per room). Twin bedding possible in following room types on request only: Junior Suite, Superior and Superior Plus. 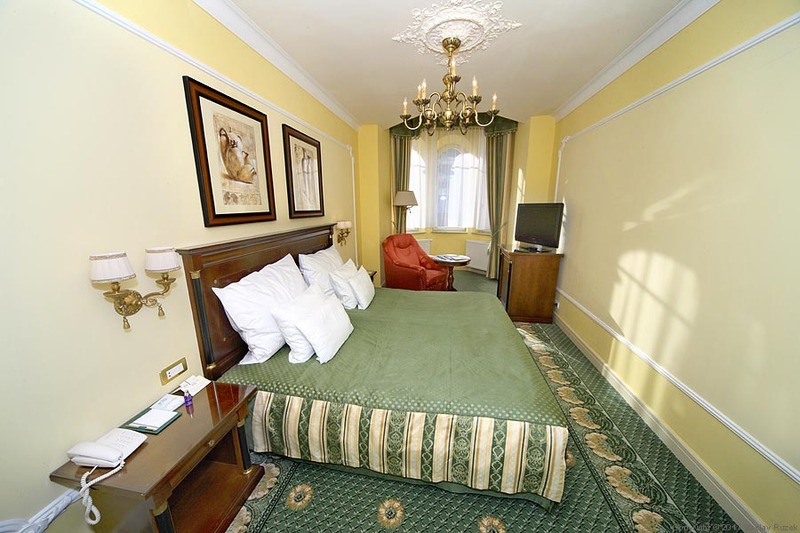 Detailed room specifications in PDF. 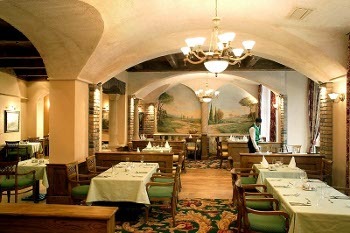 An exquisite menu with international cuisine, which would be relished even by the most fabled of fairy tale kings, world wine brands and a pleasant relaxing atmosphere is offered by three restaurants, cafés, and bars. 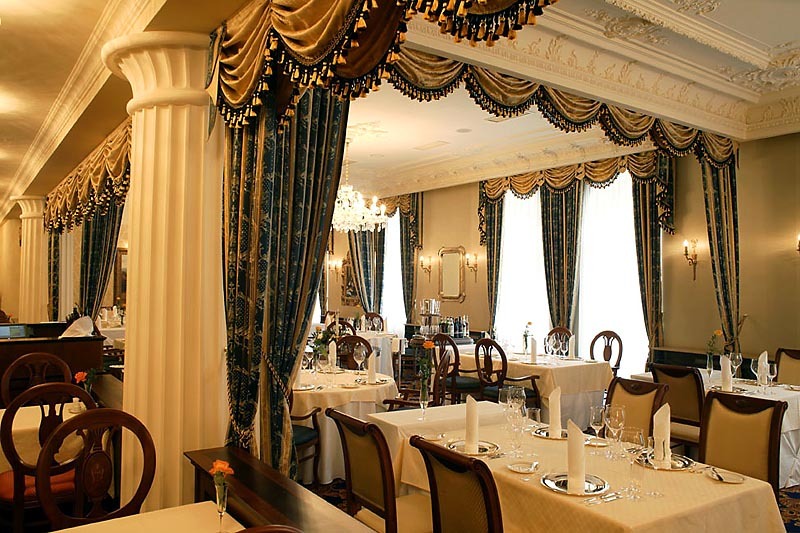 The refined atmosphere of the La Boheme Restaurant with its marvellous French cuisine and a not less outstanding French chef, an enticing wine card and irresistible desserts will create a private oasis of peace and ease especially for you. 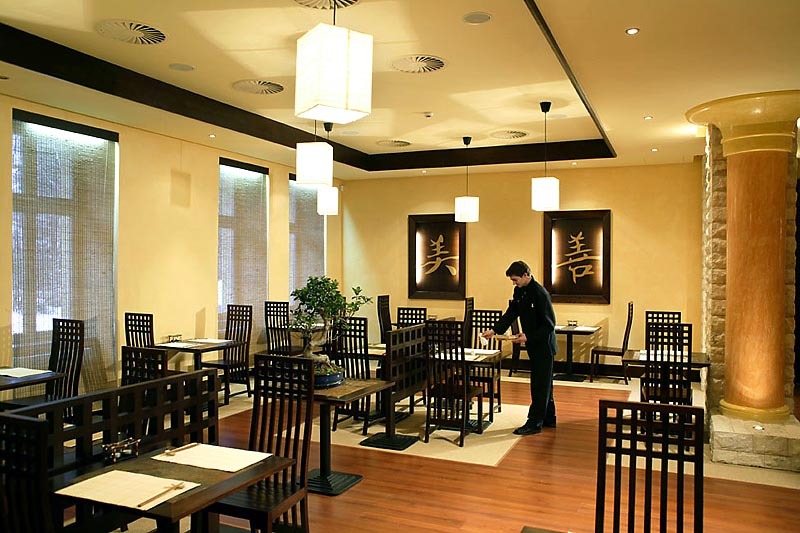 The appetizing aroma of Oriental cuisine specialities, prepared by a genuine Japanese chef, delicious sushi, delicate kung-pao, a grand wine card and its eye-appealing interior evoking the picturesque landscape of the lands of the Orient - you can find all this in the restaurant, aspiring to become the attraction of the Carlsbad Plaza and most certainly of Karlovy Vary. 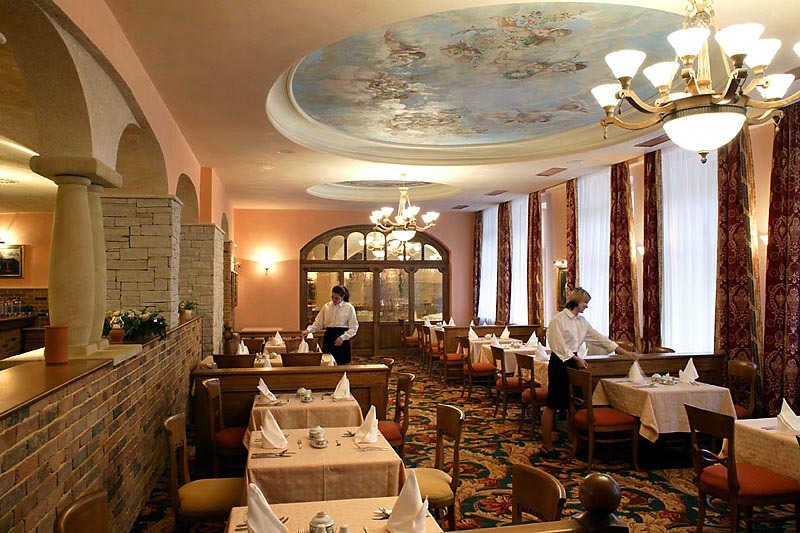 The cosy interior of the Sorrento Restaurant, which will take you on a short journey back to the time of you summer vacation by the sea offer its abundant buffet tables available throughout the day. Its homely interior lures you with the aroma of morning coffee and a rich breakfast for a successful start into your new day, or for a quick lunch or an informal dinner. If you fancy a small snack, a delicious titbit with a cup of your favourite coffee, you are at the right place. Enjoy it with your friends or on your own during a break of challenging business negotiations and you will see that everything will go better. 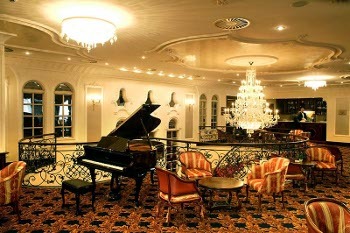 Its pleasant interior, intimate lighting, a great band and classic rhythms - you can find all that in the Old Times Bar. 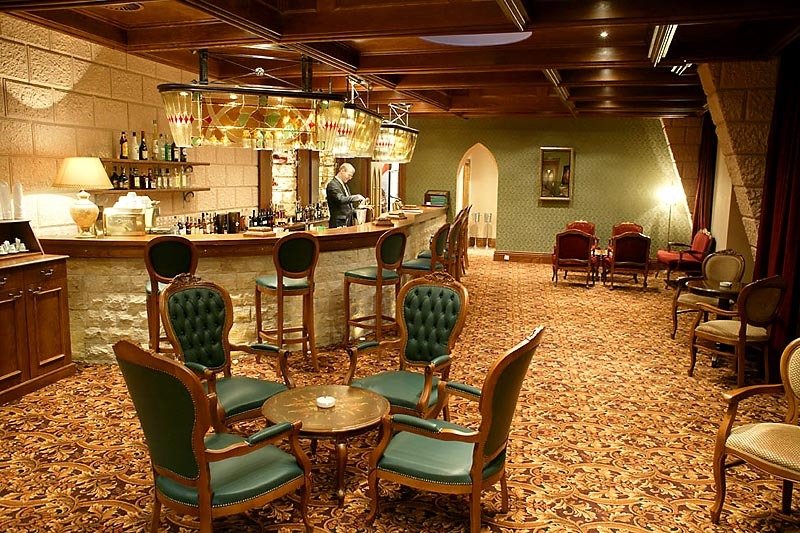 Withal, it is not only for the “oldies”! Take advantage of actively regenerating your mental and physical strength and select from a wide variety of procedures in the Wasserplatz with a thermidarium, two wellness pools with a whirlpool and thermal mineral water, or a large swimming pool with a counterflow jet. 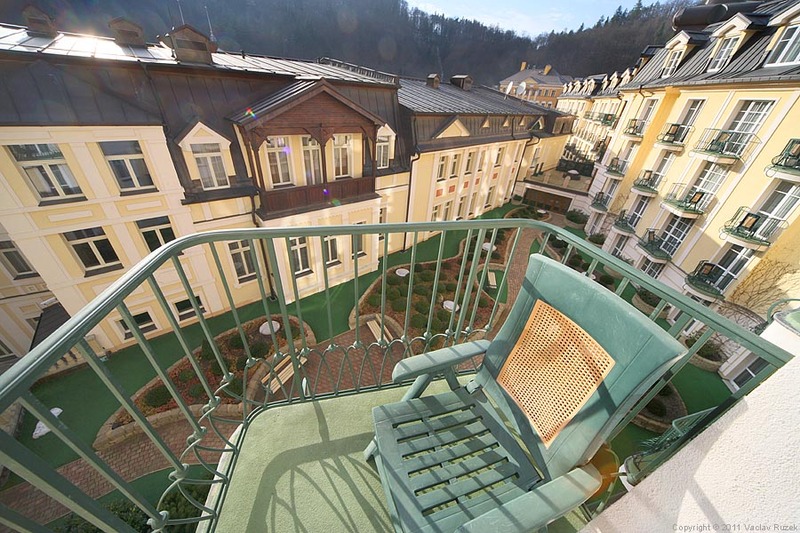 You will personally experience the effect of seven kinds of sauna in the Saunadorf, slow down your pulse in the tranquil atmosphere of the Relaxgarten with heated sunbeds and water beds and relaxing music, and indulge in the pampering experience of unbelievably pleasant and effective massages in the Verwoehngasse - Thai massages, Ayurvedic procedures, untraditional honey or chocolate massages will undoubtedly get you in a pleasant mood. Moreover, you can complement your lost calories with a small dainty in the Kaiserhof Bar and hush up your twinges of conscience by thorough exercise in the fitness centre. 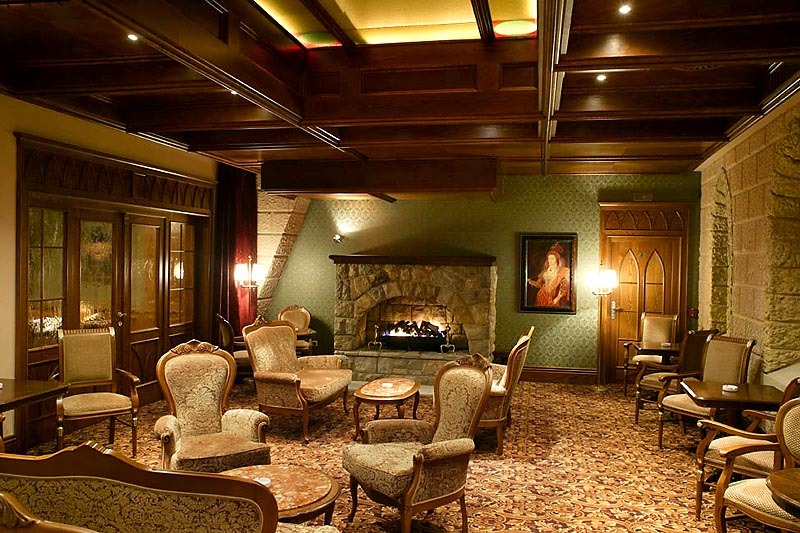 The classic spa treatments are rendered to patients older than 12 year. Pregnancy may be a contraindication for spa treatments. Most frequent diagnostic methods enabling to determine obesity consist in the calculation of BMI ("Body Mass Index") or subcutaneous fat measurement. 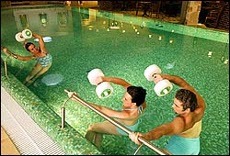 The hotel Medical Spa Gallery in cooperation with the Carlsbad Clinic offer a set of examinations together with a complete program comprising successful slimming methods - a special "Weight Loss Package" - to all people desiring to enhance their fitness and to improve their state of health. Apart from medical examinations and laboratory tests, the curative set also offers untraditional examination with concrete results and check-ups by an obesitologist, using the B.I.A. device, development of an individual dietary program, numerous options of slimming diets in the form of a menu with four meals, lymphodrainage and large selection of further 45 procedures. 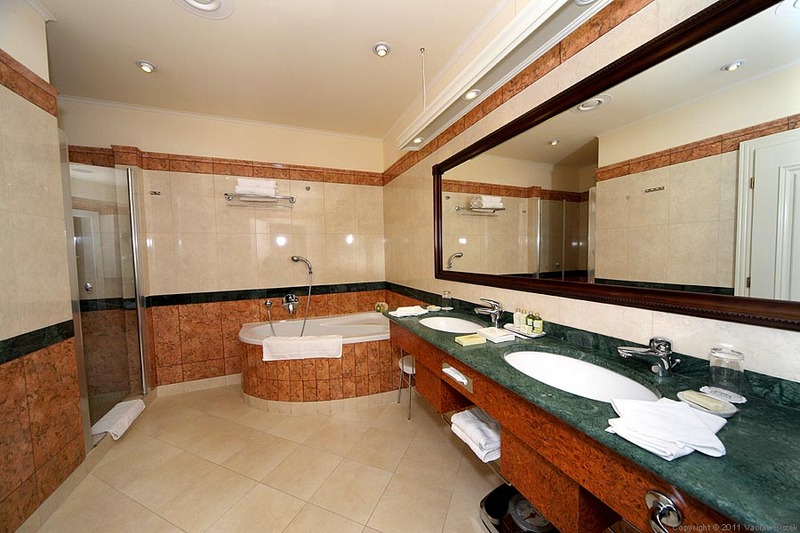 You may book the Weight Loss package, which will affect your health and approach to nourishment and responsible life style drastically with the minimum effective length of stay of 14 days at the Carlsbad Plaza hotel. Hotel offer 4 interconnectable Churchill (36 seats), Masaryk (25 seats) and Kennedy (24 seats) lounges, or the more intimate Atatürk Lounge with an original and rare interior, so carefully protected during the reconstruction. 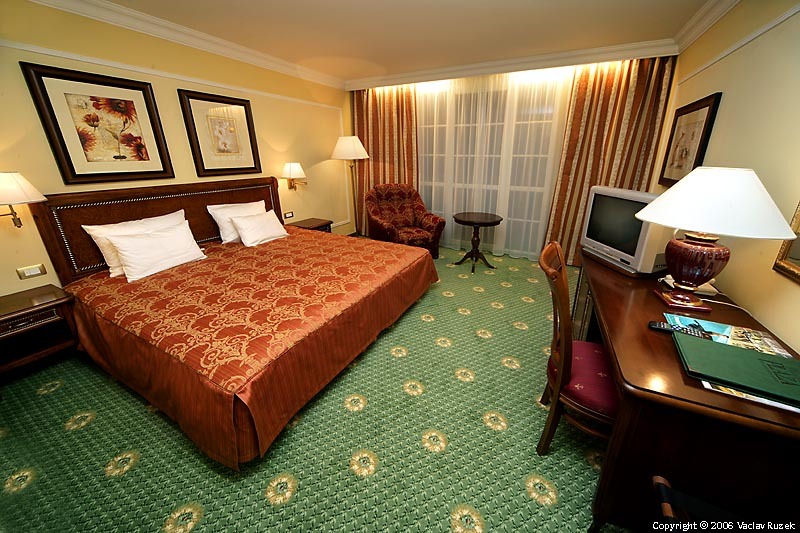 In addition, ISDN, common television antenna, TV, interactive TV mode, telephone, Internet and WiFi access are available on all the premise. Interpreting services, top class catering and full cleaning services are a matter of course. Individual negotiations as well as smaller size business meetings may be held in the business rooms furnished with an office and appropriate technical equipment (Internet, copier, telephone, fax, scanner). 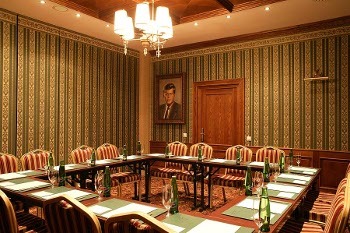 This is the first facility of this type to be operated in Karlovy Vary. The spa Carlsbad Clinic was established on the reconstructed premise of the former hotel Eboli, in the vicinity of the Carlsbad Plaza hotel with which it is connected on three stories. We know how to help you and we have a wide range of options to offer you. 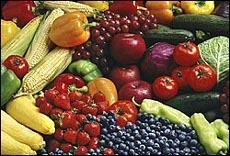 The combination of alternative medicine and modern treatment allows us to make your body and soul interact in harmony. 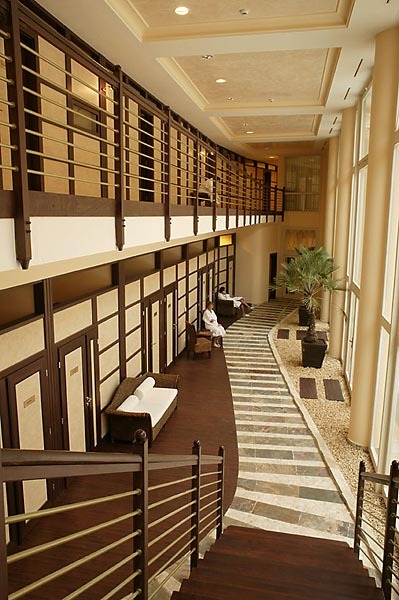 When entering our clinic, you are walking in a temple of beauty and health. After undergoing a medical examination and assessment, you will be presented with a wide range of recommended therapeutic and diagnostic methods. You can use the services of all-body cryotherapy, traditional as well as diverse kinds of Thais massages, skin and body treatment with Thalgo natural cosmetics, and intestinal lavage. We can also perform radical procedures should your condition so require. 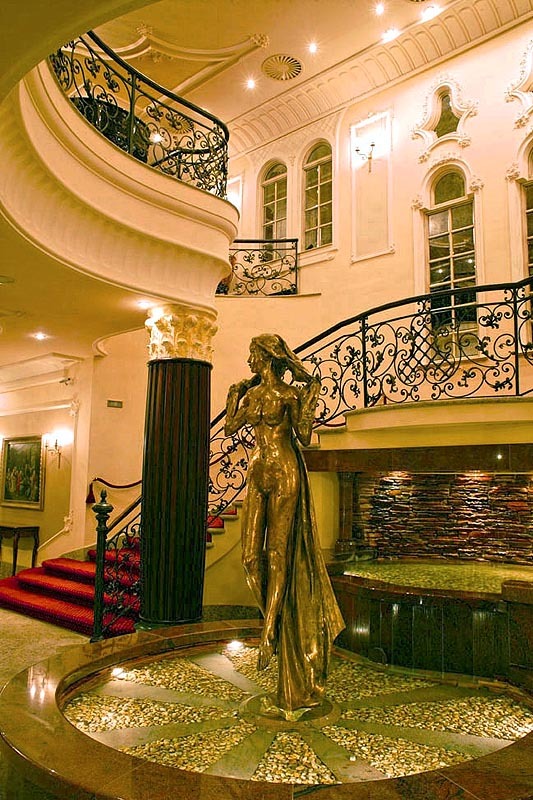 We have a modern operating theater where our professional team corrects the imperfections of you body, employing out-patient surgical techniques, which means that most clients leave the facility immediately after their surgical procedure. 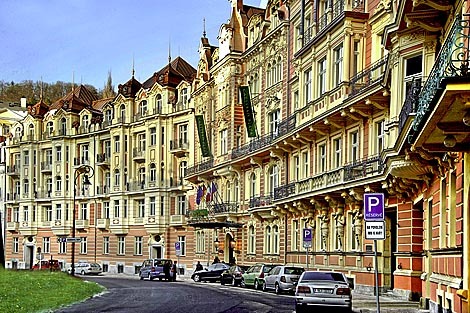 All of the services provided by the Carlsbad Clinic are available to Karlovy Vary's visitors and inhabitants. The Carlsbad Clinic is open 7 days a week. 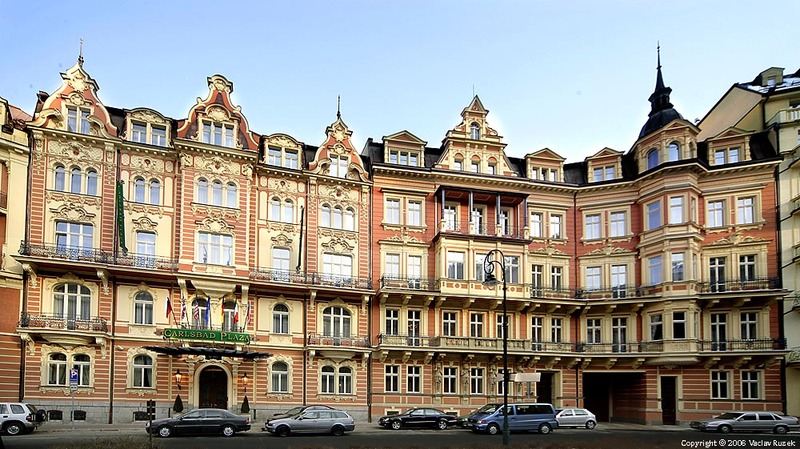 Total investment made in the clinic, its equipment and furnishings exceeded CZK 50 million. don't include breakfast and spa tax 0,50 EUR per person (15 years and older). 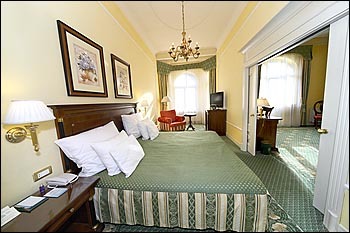 Prices of Wellness Suite, Moser Crystal Suite and Presidential Suite incl. 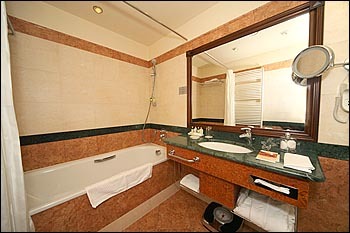 free use of private sauna in the room. (medical examination once per week, 15 spa procedures per week & daily free entry to Wellnessland). 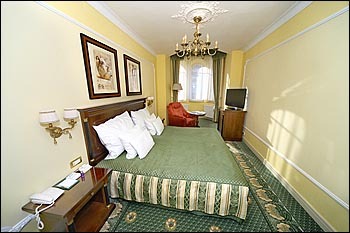 The prices are based on double occupancy except Queen & Princess rooms. 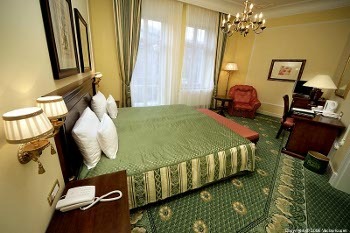 In case of single use an additional charge is applied (half of the room rate). 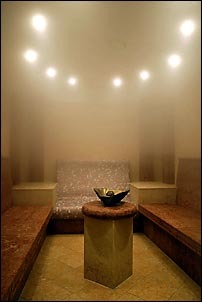 Spa treatments are only provided for persons older than 12 years. 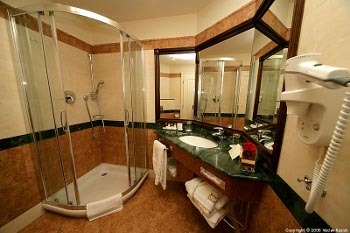 Please note that for effective spa treatment it is needed to stay at least 7 nights. 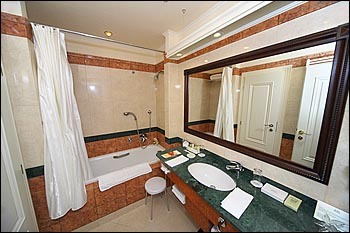 Nevertheless if you want to stay less time, you can order individual spa procedures. In this case you pay the room rate and specific spa procedures from the price list below.